What’s Up With The 1975? If I could, I would link The 1975‘s website and social media accounts to this post in case you weren’t familiar with them, but unfortunately I can’t. Because they’ve all been deactivated. 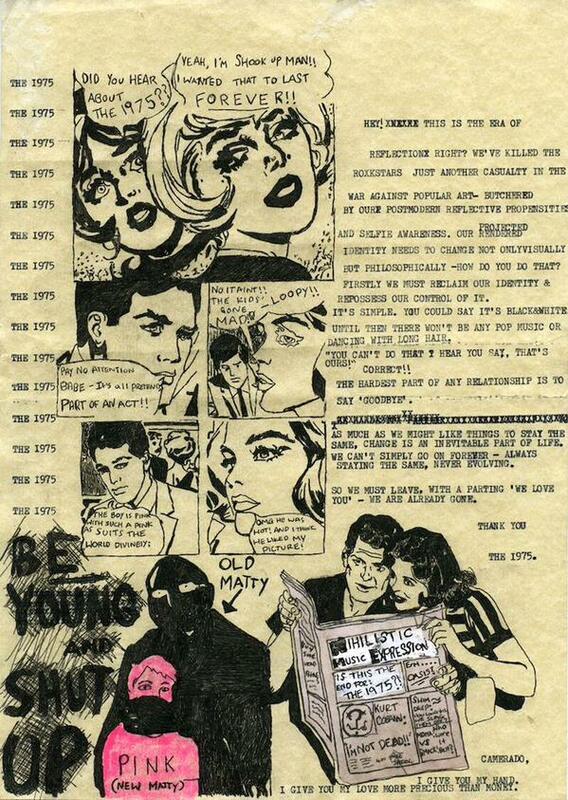 Twitter was in a frenzy yesterday when the British rockers posted a cryptic comic strip, insinuating that The 1975 is “gone.” Shortly after, all of their social media profiles were deleted, leaving many fans confused, wondering if the band had broken up. After much speculation and analyzing with friends, we’ve decided the band is not breaking up. Rather, they are creating a new identity, a new sound, new music and perhaps a new name. They are saying “good-bye” to their The 1975 aesthetic and are creating a new one. The band has a history of changing their names many times and it shouldn’t be a massive shock if that’s what is happening now. With today being June 1, it’s very possible that we’re getting something today. If this is a ploy to garner attention and to excite (and scare) fans, it’s certainly working. Our eyes are peeled for something new today from whomever this “new” band may be. Seeing The 1975 at the Tower Theater this past year was one of my favorite concerts ever, and I’m so excited to see what’s in store for them.